A few weeks ago, a fellow emailed my husband and asked to purchase ad space on this blog for his self-published book. Since we're fussy about the ads we accept, my husband told him we couldn’t post an ad without first reading the book. Well the book arrived promptly and we started looking it over. We were astounded. It was superb. And I mean superb. 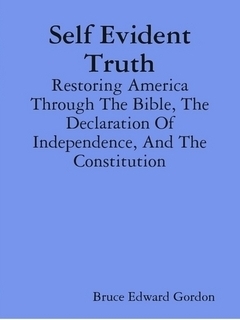 The book is entitled “Self Evident Truth: The Blueprint for America’s Restoration” by Bruce Edward Gordon, and it is a tremendous resource for the biblical foundations for our founding documents such as the Declaration of Independence, the Constitution, and the Bill of Rights. Within days I was doing something I had wanted to do for a long time: I started a Civics course for our homeschooled daughters, and Mr. Gordon’s book became our textbook. The book is not terribly long – 85 pages – but those pages are full-sized (8.5x11) and the text is absolutely packed with information. The format is part history, part reproduction of the actual documents, and a lot of study guides for those documents. He picks apart the Declaration of Independence line by line, for example, and I’m using his study guide with our daughters as they memorize portions of this elemental document. In truth, Mr. Gordon’s book doesn’t contain any information you couldn’t find somewhere else… if you wanted to dig through mountains of books and hand-copy relevant passages. But “Self Evident Truth” already does this for you and puts the information into an easy-to-read and easy-to-teach format. It's rather unusual for us to accept an ad from an author, but we're pleased to do so. Click on his link on the right-hand side of the blog to bring you to the ordering page which gives more information. If you homeschool – or if you are concerned about the things your children are NOT being taught in public school - or if you just want an excellent reference book for your library – I can highly recommend “Self Evident Truth.” You won’t be disappointed. Well, I'll be simply dying to know the reaction of your daughters' college History professors when your daughters cite the original Founding Documents through Mr. Gordon's book -- if it is as good as I suspect it is, Heh Heh! So that your daughters can receive a balanced education Patrice while their minds are still forming, can I also recommend "Letter to a Christian Nation" by Sam Harris. There are of course many others but I chose this off the top of my head as it too is relatively short & pithy. Thank You! Thank You! Thank you so much for the kind words...I appreciate this so much. Your recommendation means a lot to me. Thank you. I don't see how an attack on Christianity would provide a "balance" to the thesis of this book. This book, as I understand it, is about our form of government. A better counterpoint would be to read an opposing political viewpoint, not a religious one. There's a reason why Marx is included in the Great Books. Reading him shows what we're up against. "Letter" is nothing more than a self-congratulatory screed. It is heartening to see more and more Americans taking active roles to reclaim our nation, government and most of all, our freedoms. Appears to be worth a look! I thougt it was amusing that our fearless leader Obama is more than happy to let you Brits pay the bill for getting oil deliverd to you from Libya. Enjoy that Quedula. I know your sad sack Navy and budget will love not having America doing your heavy lifting. It sounds like it may be a bit slanted. During the enlightenment when our country was founded it was believed by many founding fathers that religion was on the way out (much like slavery -- and they were mistaken on both counts). The primary author of The Declaration of Independence Thomas Jefferson also coined the phrase, "wall of separation between church and state", and edited his own personal version of The Bible (which would not be very highly regarded by most Christians). You may be right Michelle as I haven't read the book that Patrice recommended. I was just trying to make the point that education should be about expanding a child's mind not closing it. I find it strange that so few biographical details, education, qualifications, etc. are available for this author. Patrice, you should review this book on Lulu, since there isn't one there yet. I'm looking forward to getting my hands on this book. I feel disgusted about the American History education I recieved in high school. Mine was actually one of the better ones and my teachers were good ones, too, but the curriculum was what it was. I love to read true histories based on the works and words of the founding fathers. The reconstructionist crap is nauseating. "True histories"? Gracie. Are you a historian, or jumping to a conclusion that suits your prejudices? What are the author's qualifications? Where are the peer reviews? What articles has he had accepted by learned journals? Perhaps there are good reasons for the lack of reviews. Did you provide a balanced education to your own children by introducing them to the Bible, any works by Billy Graham, the US Declaration of Independence, writings by CS Lewis, books by Ronald Reagan or Barry Goldwater, or any book by Margaret Thatcher? Or is your view of a "balanced education" only to be foisted on American Christian Conservatives? No need to reply, I know a hypocrite when I see one. I graduated from Ball State University in 1983 with a teaching degree, licensed to teach U.S. Government, U.S. History and Psychology. I taught those subjects in a wealthy (that means "snooty") suburban public high school for 13 years. In 1996 I left teaching to pursue a sales career in the private sector because I was "burned out" with teaching in a snooty suburban public high school. I worked in the private sector for 9 years and made good money but, to my surprise, I missed teaching! I didn't think I would. In 2005 I left the lucrative world of sales and (with my wife's blessing and encouragement) took the very low paying job of substitute teacher for a different, non-snooty suburban school system in hopes of working my way back into the teaching profession. Over the course of my adult life I have developed a real passion for politics, government and America's founding. I have devoted thousands of hours of self study to all of the above. I have always had a passion and a talent for writing (one of my VERY few talents). Over the last couple of years those passions have intersected and the book "Self Evident Truth" was the result. It's pretty straight forward--a Puritan catechism over the Bible, the original words of the Declaration of Independence and the Constitution, and study guides providing definitions/explanations/historical context. There is no liberal interpretation/spin/fabrication whatsoever. You will ONLY find the original words of the Founders and my explanation of those words--backed up with evidence from the original words of the Founders. Would that be acceptable to "learned journals" or peer review committees? Absolutely not! That's what make this a good book! To Bruce Gordon. Thank you. I note your answers to my questions.